"Our consumer has demanded high standards of animal welfare, we've risen to that challenge - he's right to make the point that food security is crucially important, we would say the same - but all we're saying is: 'Produce the food to our standards and we'll have a trade deal.'" 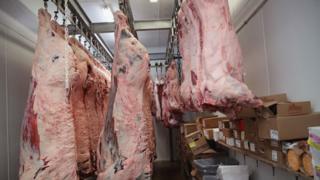 The US National Farmers' Union has always maintained that its chicken and beef, which use processes banned by the EU, are "perfectly safe" and argues there has been a lot of "fear-mongering". However, its British counterpart said the UK government should not accept a US deal "which allows food to be imported into this country produced in ways which would be illegal here". That, Ms Batters said, "would just put British producers out of business". Amy Mount from Greener UK, an environmental lobby group, said: "This wish-list shows that a hard-Brexit pivot away from the EU in favour of the US would mean pressure to scrap important protections for our environment and food quality. "Any future trade deals should reflect the high standards that the UK public both wants and expects." Despite the NFU's insistence that consumers are keen to maintain the current welfare standards in farming, Ms Batters said there was a possibility the UK would give in to the US. She said: "There's always been the risk - and agriculture has always been the last chapter in any trade deal to be agreed - so yes there is a huge risk that British agriculture will be the sacrificial lamb in future trade deals." "I think the US won't buy it in negotiations with the UK," said Dr Jones, referring to the UK's insistence on maintaining its current standards. "It's wanted, for a very long time, the EU to harmonise with US regulations and approaches to the production of food and it's exactly what it'll ask of the UK as well." Producers argue that it stops the spread of microbial contamination from the bird's digestive tract to the meat, a method approved by US regulators.